This Desmond Tutu quote I saw in a friend’s email signature wouldn’t get out of my head for days. It so eloquently captures the reason I’m doing this work. The idea that systemic change comes from small efforts compounding over time makes sense in my head and heart. It motivates me and helps me to see the potential impact of the work we are doing. I believe our bit of good comes in the form of building an informed and engaged network whose decisions and actions together can create a more inclusive and equitable energy system in Texas. There is a lot of activity happening at TEPRI. We’ve had an exciting and busy fall so far. Please check out some of our latest updates below, and as always – please let me know if you’d like to connect! 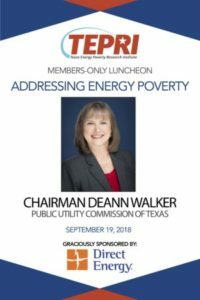 Last month, TEPRI hosted a members-only luncheon with the Public Utility Commission of Texas (PUCT) Chairman DeAnn Walker. Graciously sponsored by Direct Energy, the event offered a great opportunity for TEPRI members to meet and share their perspectives on tackling the challenge of addressing LMI consumer needs with the Chairman. A robust discussion, Chairman Walker encouraged the attendees to ask questions, raise concerns and provide insight. The Chairman assured regulatory support wherever feasible to create opportunities for Texas’ electricity market stakeholders to create innovative strategies and business models to cater to the needs of the underprivileged consumers in the state of Texas. The discussion helped TEPRI and our member organizations not only to understand the PUCT’s position on the energy poverty challenge facing the state and the rest of the nation, but to also appreciate necessity for cross-industry collaborative efforts necessary to overcome it. Partnering with the UT Energy Institute, TEPRI has officially begun development of our Energy Poverty Clearinghouse online portal. This comprehensive portal of information on publications, studies and other resources specific to the topic of energy and poverty in Texas will be a seminal “go-to” source to inform our members, stakeholders and the general public on all the trending issues, technologies and services related to low-income energy burdens in America. Thank you to the State Energy Conservation Office for their support and partnership on this initiative. All of the resources referenced in the “Energy Poverty Research Landscape Analysis”, a publication TEPRI released in May 2017, will be made available through this portal. Download a copy of this report here! Energy & Housing Advisory Committee – Based on success of the Empowering Texas Communities Conference earlier this year, we are partnering with the Texas Association of Community Development Corporations (TACDC) to explore tangible activities that link together energy, community development, and affordable housing sectors to better serve needs of low-income households. If you would like to participate in this group, please contact me. Other working group topics we are exploring include: Distributed Energy Resources, Financing and Energy Efficiency Technologies – all with a focus on low-income households. We believe each of these groups will have overlapping touch points and will learn from the work of the others. Stay tuned for more opportunities to get involved in 2019! We are excited to be speaking on important connections between energy poverty and hunger in Texas and opportunities for collaborative efforts. If you’d like to join us at THI sign up here! The UT Energy Symposium welcomed us earlier this month to give a talk titled “Addressing Energy Poverty in Texas.” The UT Energy Symposium is sponsored by the UT Energy Institute in an effort to provide a multi-disciplinary platform for UT faculty and students to interact on the most pressing energy issues facing our world. Watch the recording of the presentation here. Thank you to AWE for inviting us to be featured at this productive annual conference. This event focused on grid modernization initiatives and other technologies to improve reliability, resilience, security, and affordability. TEPRI moderated a panel entitled “Industrial, Military and Residential Consumer Perspectives on Grid Modernization” featuring Sheri Givens (Givens Energy), Katie Coleman (Thompson & Knight) and Brian Stevens (Texas Military Department). Organized by Texas A&M University and co-sponsored by State Energy Conservation Office (SECO), the Texas Energy Summit 2018 brought a diverse group of energy sector stakeholders together in Houston to share, explore and discuss the present challenges and future opportunities facing the Texas electricity markets. TEPRI was grateful to organize a panel discussion on ‘Clean Energy for All: Exploring Low-Income Energy Issues’ featuring Kim Campbell (TXU Energy), Nat Tredway (Distributed Energy Financial Group), and Emma Rodvien (Solar United Neighbors). Rocky Mountain Institute convened a group of thought leaders for e-Lab Accelerator, an invitation-only, four-day working meeting to accelerate high-impact and innovative projects at the electricity system’s distribution edge. TEPRI was delighted to participate on a team focused on LMI Customers and Regulatory Proceedings, exploring ways to engage low-and-moderate income customers in equitable processes that produce durable results. In August, TEPRI welcomed its first full-time Research Associate, Dr. Ali Adil, who completed his doctoral degree from the University of Texas at Arlington. Dr. Adil’s research focused on the socio-structural challenges facing low-income communities who wish to go solar. Given Dr. Adil’s expertise on low-income consumers, his addition to the existing team will help expand TEPRI’s research capacity towards continuing to inspire lasting solutions for this market segment. Dr. Adil’s research endeavors at TEPRI will be instrumental to furthering our commitment towards understanding the low-income consumer segment, exploring innovative strategies and implementing creative solutions to address their needs, in accordance to their specific preferences.